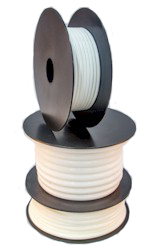 Reliably sealing cord for static application made of unsintered PTFE with, for the foodzone approved, lubricant, silicone free, universal application. For static uses as valve stem packing, wide range of many other slowly moving or static applications. 100% pure virgin PTFE, braided and wrapped with special PTFE tape. Unaffected by most chemicals in range of pH 0-14, except molten alkali metals and element fluorine. Unaffected by most chemicals in range of pH 0-14, except molten alkali metals and element fluorine. Physiologically harmless, it fullfills the FDA (US-Food and Drug Adminstration Title 21 CFR §177.1550) requirements for use in contact with food. Physiologically harmless, iut fullfills the FDA (US-Food and Drug Adminstration Ttle 21 CFR §177.1550) requirements for use in contact with food.